So what are these recalcitrant foreigners objecting to? They include the timeline of the so-called “emergency brake” to restrict in-work benefits for EU migrants in the UK; curbs on child benefit for EU migrants whose children are not in the UK; and potential treaty changes to exempt formally the UK from the goal of “ever-closer union” and to underpin protections for non-eurozone members. In reality then, little of real substance or meaning. All these factors are about symbolism, the symbolism of playing to the gallery, the baying mob of Eurosceptics and Kippers, tabloid cheerleaders and Mittel Ingerlund. Is this historical? Geographical? Is it motivated by Easyjet or the Auld Alliance? Who knows, but there is a significant and growing gulf in sensibility and intention towards our place in Europe north and south of the border. Are we more immune to the virulent strain of Euro-septicaemia than our southern cousins? If Cameron can’t get a deal by this afternoon the Hounds of Hell who have been champing at the bit will be unleashed. 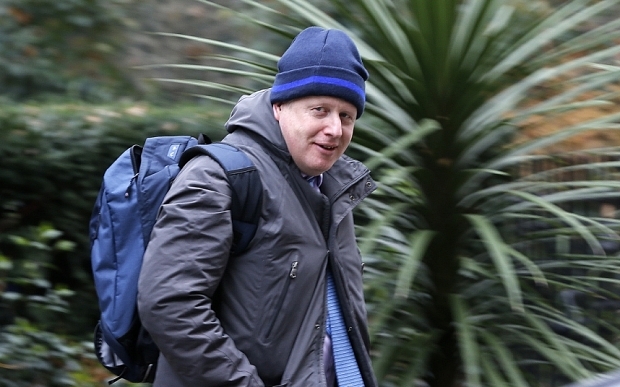 Unled by the oafish Boris hanging about like an urban rambler outside No 10 yesterday. If he does secure a deal Mr Cameron will call a Cabinet meeting, effectively firing the starting gun on the referendum campaign, as Eurosceptic ministers will finally be free to campaign for a Leave vote in the poll expected on June 23. But it’s a lose-lose situation for Cameron. Even now his momentum and credibility have slipped dangerously and it will take an unlikely breakthrough for him to recover. Any deal now will be seen as weak and inadequate by the lobby group who had already decided this anyway. Cameron will have succeeded only in further alienating our European neighbours, and, inadvertently creating an opportunity for Scotland to object to what may become a forced ejection from EU membership, a political exile firmly rejected by Scottish society. But hey, when did it ever matter what we thought? Excellent article. Cameron’s only motivation is self-interest. The Tories have always viewed Europe as a trading area and nothing else. They also find the idea of pooling and sharing an alien concept closely alligned to socialism which they reject as a matter of political dogma. Their views,especially with the current intake of extreme right wing MPs,are incompatible with membership of the EU and whatever “deal” Cameron comes up with will not satisfy their instinctive hostility to the whole European project. The “deal” will be designed to fool the group of voters that can always be fooled into thinking that something radical is on offer when in reality,even those countries outside the EU who wish to trade with the market have to adhere to most of the “red tape” from Brussels. It will be interesting to see how HM right wing press,the overtly anti EU Telegraph and Mail in particular,present Cameron’s deal to their readership. Don’t underestimate Cameron – he has delivered everything “they” wanted and some – Blair and Boris pale by comparison. If he does “Fail” then it must surely be more likely than not, that that was what was intended all along. Don’t mistake this Kabuki negotiation for the real thing. Media love heroic narrative, so DC gives them one. All optics, no real substance. There will be a deal, big beasts will fall in line, IN will win, and the charade will play out. Nevertheless, Scottish Separatists like Mike Small think it is acceptable to lecture people in other parts of the UK about immigration, migrants, refugees etc. – when Scotland has the most homogenous population in the UK. Who are you to lecture others about immigration, the EU etc. when you have had all of the benefits and non of the disbenefits? Because you are a moral vanity point scoring virtue signaller, that’s why. “Scotland to object to what may become a forced ejection from EU membership”. The UK is going to vote to remain by about 55 to 45%. Then you can and find something else to whinge and whine about, and blame others and out-groups for your own problems, generated by your own indolence, bad choices and lack of self-agency. No change there of course! Oh, you’re a right wee ray of sunshine, eh? Must meet up for a pint some time – not. The UK’s assets and population are crammed into the South of England, as policy, by generations of Westminster governments, and you moan about the Scots. Rich indeed. And let us not forget that a YES vote would have meant Scotland’s expulsion from the EU, with only a NO vote securing our place. No ifs, no buts, courtesy of Project Fear. How the skittles fall. Your opinion of Scotland is obviously coloured by the pack of hounds posing as your news media. This may explain your ignorance. Your arrogance is another matter. A YES vote would not have meant Scotland’s expulsion from the EU. The media in the UK spun his remarks to fit the expulsion story but his office issued a statement after his speech that clarified the position of an independent Scotland – no expulsion. There would of course have been an element of renegotiation of the terms of membership which, no doubt, would have been put to the people of iScotland to accept or not. Scotland’s laws etc are fully compliant with EU regulations since it has been a member via the UK for almost 50 years. Welfare benefits ? No closer union ? My backside ! This entire farrago is about securing exceptions and exemptions for the Tories paymasters in the city from any attempt by the EU to regulate or restrict the insane casino banking that caused this mess. The Tories and those they work for are hell-bent on business as usual. Until the next collapse. Why not ? They walked away laughing from the last one ! London is the part of the country that has experienced the most immigration and it’s more pro-EU than the rest of England. In fact London and Scotland have been pretty similar on the EU in previous polling over the years. So the idea that those who are exposed to the most immigration will flock to anti-EU Tories/Ukippers isn’t accurate. Even Miliband’s Labour outpolled the Tories by over 9% of the vote in London last year, despite flopping everywhere else. Which in fairness also makes the SNP narrative, which typically frames ‘Scottishness’ in opposition to London, similarly inaccurate. In reality it’s the rest of England we have more of a disjoint with politically – including many areas that have very little immigration. Like the majority I regard Scotland as a European country. I also consider myself to be Scottish rather than European! I am drawn to remaining within the EU but on terms best suited to Scotland rather than on the basis of the ongoing charade of negotiation which seems to me to have disconcerting parallels to the pre. Indie ref. vow. I do however have significant concerns about the democratic deficit within the EU which in turn raises fears that we may simply be exchanging Westminster for Brussels. “What is the SNP’s position on the EU? I will want to see considerably more flesh on the bone of the argument in favour of remaining within the EU before I cast my vote in June or whenever DC deems most opportunistic. “Scotland to object to what may become forced ejection from EU membership”! I thought membership was held by the UK. Scotland is part of the UK by democratic mandate. It was only a short time ago that Salmond was beating about Scotland remaining as a member of the EU in the event of Independence being the will of the Scottish People. When the EU pointed out that would not be the case Salmond stated he had taken “legal” advice and was assured that Scotland would remain in the EU. When questioned about this advise he bluffed and blustered and eventually it was dragged out of the SNP that no such advice had ben sought or received. This position was entirely based on someone in the SNP expressing and opinion. They could not even name that someone. So for wee Nicola to try to use this as the basis for another referendum would not only be ridiculous but I suspect would be subject to legal challenge by numerous interested parties. I don’t buy the 66% to 33% in favour of staying in amongst the Scottish population, it has never been properly tested and is being purveyed by pollsters with vested interests. Let the people have their say on UK membership and when the results are known look at how to move forward. Politicians cannot be trusted with these decisions. May I respectfully ask what Nicola Sturgeon’s height has to do with anything? Typical Scottish cringe. And as for political pygmies, I take you think that shower of trough-snouting psychopaths down in that sewer at Westminster and the House of Lords are titans and statesmen, yes? “take it you think” it should have read. It irks me when people think that I might be thinking something which I have not even suggested. I have scant respect for any politicians and have a loathing for hypocrites who portray themselves as public servants all the while lining their pockets from the public purse. Indeed I would extend my loathing to utter contempt for politicians who prior to election make statements that their role in parliament is or will be their sole job, when they know they are lying through their teeth. There are very few politicians who live up to their promises and SNP politicians are no different from their counterparts. Unfortunately we still vote tribally and I am sure there must be some independent thinking people who stand but are never elected and would provide better representation. The idea that any party represents the will of the people is completely wrong as in most cases they are elected with substantially less than 50% of the electorate actually voting for them. Personally I would make voting mandatory. And in response to your question may I respectfully suggest that Nicola is not very tall, hence the adjective to describe her as wee seems to me to be perfectly reasonable. Why anyone would think this is derogatory is beyond me. Now if I said Nicola was a numpty who constantly jumps on bandwagons and self publicizes I could accept that this was only partly true. It is wee Mhairi who is the numpty. All opinion polls have to be taken with at least a pinch of salt, but it is interesting that post-referendum it was found non-UK EU-born voters were majority against Scottish independence. (English/Welsh/NI-born voters were more opposed). One of the consequences of ever closer union may well have been diminishing appetite for assertions of national sovereignty. The ongoing euro crisis, and another border failure this summer, could of course change that. Poland and Hungary are already breaking ranks. The Dutch have a national cuisine? What might that be?